Personally I love sunglasses and one of the most original sites in Madrid is Wilde Sunglasses. They are original designs (nothing conventional), its creator (“Cao Wilde” as we all know him) will personally assist you. The store is located in the Barrio de Las Letras, with bohemian streets. 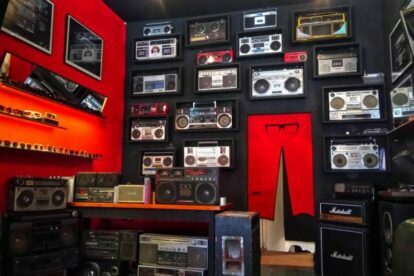 Besides the glasses, upon entering this store you will find a collection of boomboxes; they mix the experience of design with music. What you really need is sophistication for the sun, along with vintage style, which is the signature of the brand. In addition, the store in its basement has an art gallery; part of the philosophy of the brand is to support the talent of others and this space is dedicated to emerging artists. The first store was in Barcelona and now we have it in Madrid. It’s an essential accessory in the city of blue skies, and if you have a little fashionista spirit, here it is impossible to leave empty-handed. Ask Cao (the owner), he will definitely give you great advice and the best recommendations on these stylish glasses. Also the history of the boombox collection is very interesting to listen to. Now you know it, you won’t be able to stop visiting this curious place.